"The Indians had a precisely balanced relationship with their food supply. Soon after the arrival of the Americans serious depletion of that supply began to occur: mining operations adversely affected salmon fishing and destroyed fish dams." (Heizer, 1978:108) On the Americans' arrival, the large ranchos were broken up, and the new, more numerous landowners on smaller parcels of land were less tolerant of Indians. The small ranchos were farmed and grazed more intensively, and this caused an even greater reduction in the Indians' natural food supply. Jobs once belonging to Indians, especially skilled jobs, were taken by Whites. We need only look at the early record of the California Legislature to understand the relationship of the Americans to the native population during this era. At the first State Constitutional Convention, those assembled voted to eliminate the Indians' right to vote because they feared the control Indians might exercise. In 1850, An Act for the Government and Protection of Indians was enacted by the first session of the State Legislature. This law set the tone for Indian-White relations to come. The Justice of the Peace would have jurisdiction over all complaints between Indians and Whites; "but in no case shall a white man be convicted of any offense upon the testimony of an Indian or Indians." If any Indian was convicted of a crime, any White person could come before the court and contract for the Indian's services, and in return, would pay the Indian's fine. During 1851 and 1852, the California Legislature authorized payment of $1,100,000 for the "supression of Indian hostilities. Again, in 1857, the Legislature issued bonds for $410,000 for the same purpose." (Heizer, 1978:108) While theoretically attempting to resolve White-Indian conflicts, these payments only encouraged Whites to form volunteer companies and try to eliminate all the Indians in California. The other practice that provided much of the labor force, especially in southern California, was to have city officials pick up Indians as vagrants. These officials would then turn the Indians over to the ranchers and other people who needed laborers. This was all done under the provisions of the 1850 law. After four months or some other term of service, the employer would return the Indians to the city, usually to a place where alcohol was served. Shortly after their return, the Indians would be picked up once again as vagrants, and returned to the labor force. These types of activities occurred until 1866, when, to comply with the 14th Amendment of the United States Constitution, the State Legislature repealed the law. The 14th Amendment provides that no state should infringe on any citizen's "privileges or immunities" nor "deprive any person of life, liberty, or property without due process of law," nor deny to any person "the equal protection of the law." While the state was enslaving and eliminating California natives, the federal government, in 1851, appointed three commissioners to negotiate treaties with California Indians. By 1852, 18 treaties had been negotiated with 139 tribes. The treaties were negotiated because the federal government perceived Indian tribes as foreign nations, and treaties were the legal means for developing an agreement and ensuring peace with them. The 18 treaties set aside 7,488,000 acres of land, or approximately one-third of California, for Indian use. This land settlement was similar to that negotiated with other tribes in other states. The treaties also provided funds for materials and food to allow the Indians to become self-sufficient. The treaties met with hostility in California. On January 16 and February 11, 1852, the State Senate concluded that the treaties "committed an error in assigning large portions of the richest mineral and agricultural lands to the Indians, who did not appreciate the land's value." (Ellison, 1925:4-5) The legislature instructed the United States senators from California to oppose ratification of the treaties, and called for the government to remove the Indians from the state as they had done in other states. In February 1852, President Millard Fillmore submitted the 18 treaties to the United States Senate for ratification. The California senators were recognized and the Senate went into secret session to discuss the treaties. During this session, the Senate failed to ratify the treaties, and by order, they were placed in secret files, where they remained for the next 53 years. In 1871, the United States Congress declared that it would no longer negotiate treaties with American Indians. Although the United States Government failed to ratify the treaties, it did continue the policy of setting up reservations and moving the Indians to them. However, no attempt was made to negotiate new treaties. In 1852, while not acknowledging any claims of California Indians to the land, the United States appointed Edward F. Beale as the first Superintendent of Indian Affairs in California. Beale's plan was to establish five reserves on which the Indians would reside. Congress appropriated $250,000, and in September 1853, Beale gathered some 2,000 Indians and established the 50,000-acre Tejon Reserve. By focusing all his effort at Tejon, Beale neglected some 61,000 hungry natives. "Beale declared that humanity must yield to necessity, they are not dangerous, therefore they must be neglected." (Heizer, 1978:110) In 1854, Beale was removed from his post. However, based on the information he acquired as superintendent, Beale eventually gained control of the reservation land. Congress appointed Col. Thomas J. Henley as the new superintendent in 1854. Henley, following Beale's original plan, established the Nome Lackee Reservation; Nome Cult, Mendocino; Fresno Indian Farm; and Kings River Indian Farm. However, Henley did not act in the best interest of California Indians. The reservations suffered from lack of water. Squatters grazed their cattle on the unfenced land and destroyed crops that were being raised to support the Indians. "Most of these squatters were business partners or relatives of Henley and, therefore, impossible to remove." (Heizer, 1978:110) It is important to note that all of these early reserves eventually left federal ownership, and the Indians who resided on them were once again forced to move to other lands to make new homes. Every time Indians were removed, the commissioners prospered. In 1870, in an attempt to get away from corrupt superintendents and to convert the Indians to Christianity, the federal government turned over operation of the reservations to the Quaker Church. In California, the Methodists, Baptists, and other churches eventually took on management of the reservations. While the new management was not corrupt and was far better for the general welfare of the Indians, the church was less tolerant of Indians continuing their traditional beliefs. Thus, the reservations became missions and the first tools under American control to be used in assimilating Indians into the general population. Once again, California Indians were confronted with change and forced to adapt from being prisoners-of-war to being wards of the church. The 1870s saw two other important events in California Indian history. The first event centered on a Nevada Indian prophet who proclaimed that the end of the world was near. "The most consistent manifestation of this resurgence of native religion was the belief the end of the world was near and that the dead would return with the disappearance of the whites." (Heizer, 1978:113) Part of the effort in the attempt to eliminate the Whites was to sing and dance the traditional songs. While the prophet's dreams were never realized, the Ghost Dance, as it was called, spread throughout much of California. While the return to religious activities did not result in the return of the dead, it did encourage traditional activities among the California Indians. The second event was the Modoc War of 1872-73. A group of Modoc Indians, led by Captain Jack, fought the United States Army from a lava bed stronghold. Even through the Modocs were greatly outnumbered, it took the army more than a year to squash the rebellion. 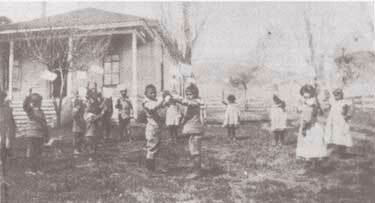 This was the last armed resistance by California Indians. In summary, this period saw the establishment of California as a state. With statehood, laws were passed that infringed on the rights of Indian people to occupy their homelands, and caused them to be used much like slaves. It was not until the enactment of the 14th Amendment that these rights were restored. Treaties were negotiated and rejected; reservations established, dissolved, and reinstated; and Indians were still in a period of unrest.